BerGenBio has reported promising results from its broad Phase II programme with bemcentinib focussed on acute myeloid leukaemia (AML) and non-small cell lung cancer (NSCLC) throughout 2018. 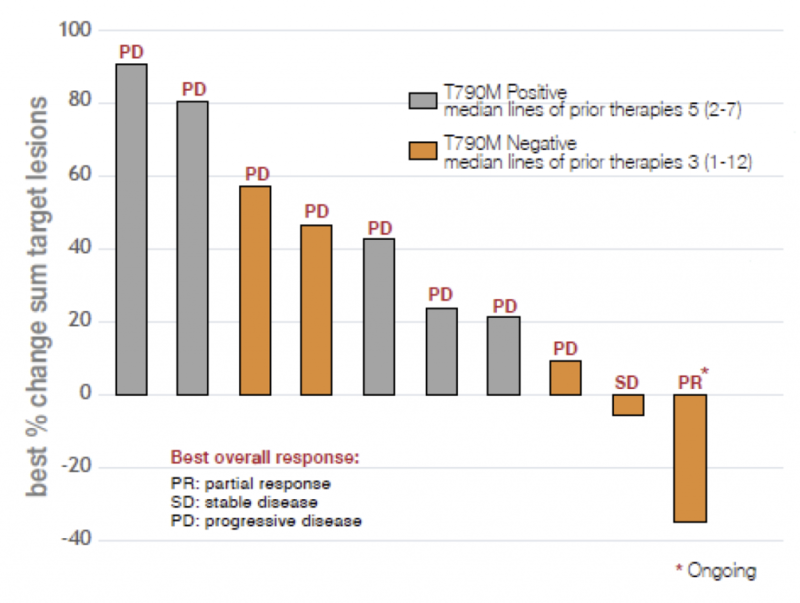 Most notable were the data from the study in NSCLC in combination with the PD 1 inhibitor pembrolizumab, in which patients with PD-L1 negative tumours responded well to therapy. The results thus far indicate the importance of biomarkers to identify those patients with Axl+ tumours, who are most likely to benefit from bemcentinib. The company is planning a series of randomised Phase II trials to confirm the findings to date, which are due to start in H219. BerGenBio also has two other products that have just entered clinical development. 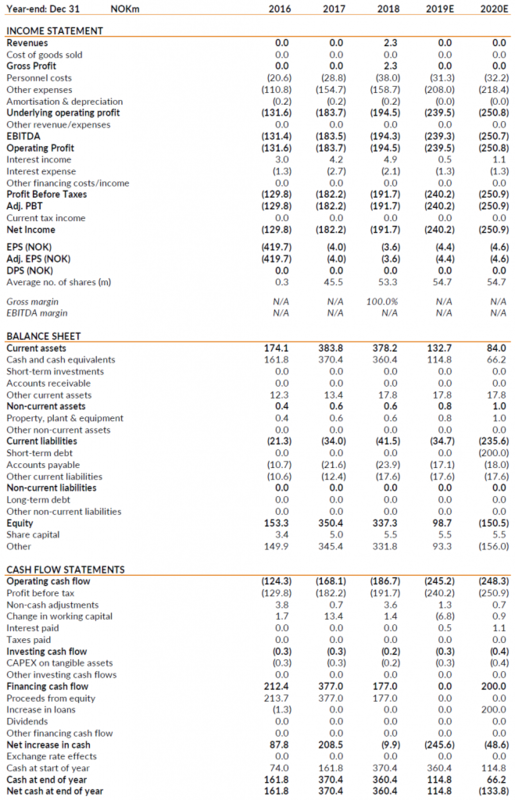 We value the company at NOK3.14bn, or NOK57.45/share. Initial Phase II results support broad potential of bemcentinib Promising efficacy signals have been detected in the Phase II studies. The data show as well that bemcentinib is well-tolerated as monotherapy and in combination (including with pembrolizumab, docetaxel, and erlotinib). Parallel evaluation of biomarkers indicates that Axl expression or blood test for Axl activity could identify those patients likely to respond to bemcentinib, and form the basis of companion diagnostic tests. Phase IIb programme to start in 2019 The quality of the Phase II proof-of-concept data so far has led BerGenBio to plan randomised Phase IIb trials, which should start in 2019. No further details have been disclosed as of yet, but we believe that there will be Phase IIb studies in NSCLC (most likely in combination with a PD-1/ PD-L1 inhibitor, such as pembrolizumab) and in MDS/AML, and that they will be used to validate the potential companion diagnostics identified during the current studies. Moving from one to three clinical programmes Bemcentinib is the most advanced selective small molecule Axl inhibitor in clinical development; however, BerGenBio also has biologics targeting Axl in its pipeline. Both the anti-AXL antibody BGB149 and the antibody drug conjugate ADCT-601 (partnered with ADC Therapeutics) have recently entered Phase I testing in healthy volunteers and patients with advanced solid tumours, respectively. Current valuation fails to reflect potential of targeting Axl We value BerGenBio at NOK57.45/share or NOK3.14bn ($370m), after increasing the valuation by NOK3.24/share as ADCT-601 has entered the clinic. Axl is increasingly recognised as an important oncology target, given its role in many aggressive cancers, and bemcentinib is the leading selective small molecule Axl inhibitor in development. We believe data from several Phase II trials over the coming year will highlight bemcentinib’s potential and act as catalysts for the shares. BerGenBio is a clinical stage biopharmaceutical company focussed on exploiting its knowledge of the Axl signalling pathway as a drug target. It was founded in 2007 by Prof James Lorens of the University of Bergen, Norway. His pioneering work in understanding the role and biology of Axl has led to the company becoming a leader in the field of Axl, with a first-in-class selective Axl inhibitor, bemcentinib (BGB324) and a collaboration with Merck & Co. Bemcentinib is being evaluated in a broad “proof of concept” Phase II programme as both a single agent and as combination therapy. The company is also assessing two other approaches to Axl inhibition: a monoclonal antibody (BGB149), and an antibody-drug conjugate (ADCT-601). In April 2017, BerGenBio listed on the Oslo Exchange, raising NOK400m ($47m) gross, with a further NOK187m ($24m) raised in April 2018. The company employs c40 people, and has research facilities in Bergen, and clinical development functions in Oxford, UK. BerGenBio is a classic biotechnology company and is well suited to valuation using an rNPV model. We have ascribed a risk-adjusted value to bemcentinib in each indication that BerGenBio is currently pursuing, and a conservative estimation of the potential of ADCT-601 to generate our core valuation of the company. 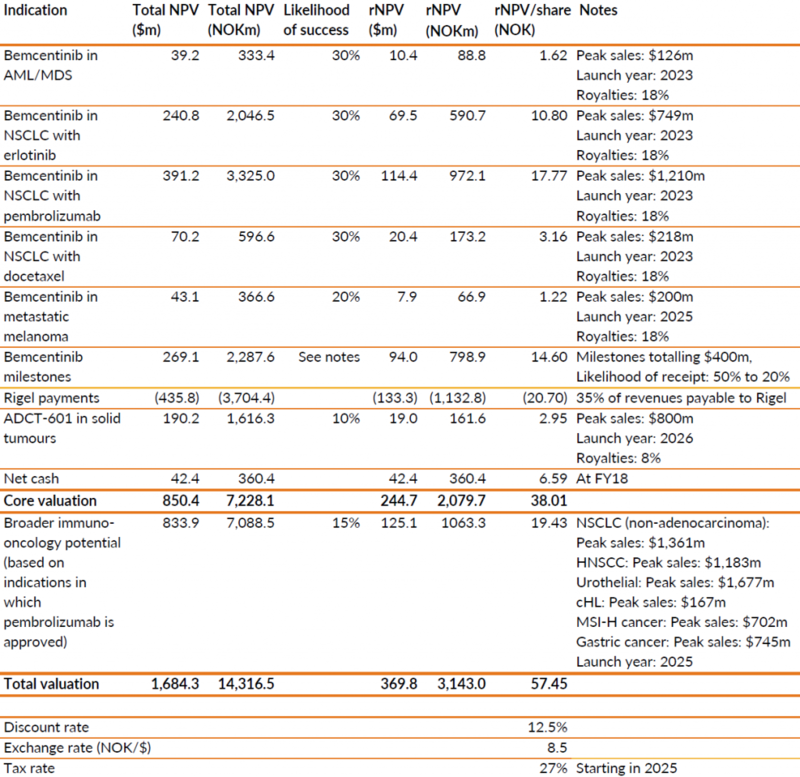 On top of this, we include an estimation of bemcentinib’s broader potential in immuno-oncology to generate our total valuation of BerGenBio. Using this approach, our core valuation of BerGenBio is NOK2.08bn ($245m) or NOK38.01 per share, with a total company valuation is NOK3.14bn ($370m) or NOK57.45 per share. To be conservative, we have not placed a value on BGB149 at this stage. Our core valuation of BerGenBio is 53% above the current share price, and total company valuation is 132% above it. We highlight that there are several catalysts to drive further upside over the next year with more data from the current clinical trials throughout 2019, and the randomised Phase II studies due to start in H219. BerGenBio had a cash position of NOK360m ($42m) at FY18, after raising NOK187.5m (gross) at NOK40.50/share in April 2018. This should allow the company to operate to mid-2020. Before then, BerGenBio will regularly report data from its broad Phase II programme, and it is possible that bemcentinib will be partnered in the interim, which would significantly extend its cash runway. Typical industry risks associated with clinical trials, regulatory hurdles, financing, possible partnering discussions, and eventually pricing and commercialisation apply. Promising data from various clinical trials has reduced the clinical trial risk associated with bemcentinib; however, results to date are so far from a limited number of patients and Axl is still a novel therapeutic target. Successful clinical development of bemcentinib, BGB149 and ADCT-601 would clearly position BerGenBio at the forefront of an exciting, and attractive, area; however, inevitably such innovation still carries higher risk. The key near-term sensitivities relate to the results of various oncology trials currently underway, and whether BerGenBio opts to out-license bemcentinib; at this stage, we expect they will seek a partner. Over the past year, clinical data from various proof-of-concept Phase II trials in oncology support the broad potential of the Axl inhibitor bemcentinib. This is particularly the case in NSCLC, where the results so far suggest that bemcentinib enhances the activity of pembrolizumab (immunotherapy), erlotinib (targeted-therapy) and docetaxel (chemotherapy). 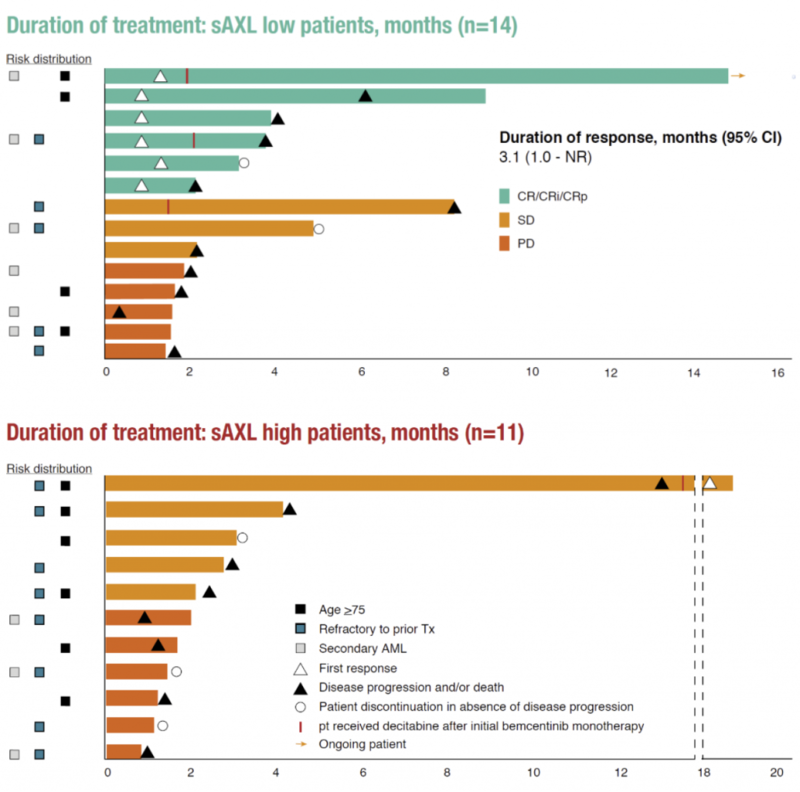 There have been similarly positive results in AML, in which Axl activity is increased. BerGenBio is now planning the next stage of clinical development with randomised Phase II trials due to start in H219 (no details released to date). The company has also advanced its Axl antibody, BGB149, into the clinic, and its partner ADC Therapeutics has started a Phase I study with ADCT-601 (BGB601). We value BerGenBio at NOK57.45/share. BerGenBio was one of the first companies to recognise the potential of Axl as a target for drug development, thanks to the research of Prof. James Lorens at the University of Bergen, Norway. The Axl receptor is now known to be involved with enabling tumours to escape immune surveillance and to develop resistance to various oncology therapies, and it also plays a role in other pathologies. BerGenBio is a leader in the field with bemcentinib (the most advanced selective oral Axl inhibitor in clinical development), as well as an Axl antibody and Axl ADC (antibody-drug conjugate) which are both in early clinical development. Promising data from proof-of-concept studies with bemcentinib in NSCLC and AML have confirmed the compound’s potential in various settings. Notably, the overall response rate was 27% with bemcentinib in combination with pembrolizumab in the 11 PD-L1-negative NSCLC patients, a group not expected to respond to PD-1 or PD-L1 inhibitors. Importantly, those patients with Axl-positive tumours responded best to bemcentinib (40% ORR, n=10), supporting bemcentinib’s proposed mode of action; and a similar result was observed in AML/MDS with bemcentinib monotherapy. There were also encouraging results from NSCLC studies in combination with erlotinib, and docetaxel. BerGenBio has integrated a companion diagnostic programme into bemcentinib’s Phase II studies. On top of the clear clinical and regulatory benefits associated with the ability to identify patients most likely to respond to treatment, it could provide an important competitive advantage. BerGenBio has identified Axl biomarkers that appear to classify those patients likely to respond to bemcentinib treatment, and which will be validated during Phase II/III studies. The company is currently planning a randomised Phase II programme, which is due to begin in H219. No details have yet been disclosed, but we expect it to centre on bemcentinib’s potential in NSCLC and AML/MDS. It is also likely that it will be designed such that the trials could become pivotal studies to support NDA filing in the US or MAA in Europe, thereby expediting the route to market. BerGenBio has also recently started a Phase I study in healthy volunteers with its Axl antibody BGB149, with a view to start proof-of-concept Phase II trials in H219. Again, the company has not yet disclosed the indication(s), but we highlight that it has potential in oncology and in various fibrotic indications. BerGenBio’s third product in clinical development is ADCT-601 (BGB601); its partner ADC Therapeutics has recently initiated a Phase I study in various solid tumours. BerGenBio has built on solid scientific foundations to build a pipeline targeting Axl, just as the potential of this receptor as an oncology target is being recognised. Its lead product, bemcentinib, is the most advanced selective oral inhibitor of Axl in development, and there are promising results being reported from proof-of-concept Phase II (Exhibit 1). Two other assets have recently entered the clinic, adding an Axl antibody and an Axl antibody-drug-conjugate (ADC) to the clinical pipeline. The attraction of Axl as an oncology target stems from the fact that it appears to play an important role in the formation of aggressive cancers (including metastasis) and the development of resistance by tumour cells to immuno-oncology, chemotherapeutic and targeted-therapeutic agents. BerGenBio is conducting a number of proof-of-concept Phase II studies, as monotherapy and in combination with various therapies with a focus on NSCLC and MDS/AML, and is now planning randomised Phase II trials to start in H219. The data from the trials to date, combined with the underlying science, has attracted an increasing number of investigator-led studies (ILS) being initiated by international key-opinion-leaders (KOLs, Exhibits 2 & 3), which should help BerGenBio gain a better understanding of bemcentinib’s ability to treat different tumours as it aspires to establish it as a cornerstone therapy for cancer. The Axl receptor is a member of the TAM (Tyro, Axl, Mer) receptor tyrosine kinase family. It is closely associated with inflammation and prevalence in malignancy, and particularly with aggressive tumours, while having limited function in normal tissues. Indeed, a Phase I study with bemcentinib in healthy volunteers conducted by BerGenBio, indicated that it was safe and well-tolerated up to 1.5g per day (a dose of 200mg per day is being used in the current Phase II clinical trials). Source: BerGenBio, clinicaltrials.gov Note: Company-led studies in black and investigator-led studies in blue. AML – acute myeloid leukaemia, MDS – myelodysplastic syndromes, GBM – glioblastoma multiforme, NSCLC – non-small cell lung cancer, TNBC – triple negative breast cancer, FPI – first patient in. The Axl receptor is activated by its sole ligand GAS6, which in turn can lead to the activation of different signalling pathways depending on the cell type affected. Notably from an oncology perspective, Axl signalling can result in immuno-suppression (via STAT1 signalling), promote cell survival (via mTOR signalling) and epithelial-to-mesenchymal transition (EMT, via Twist and Snail activation). 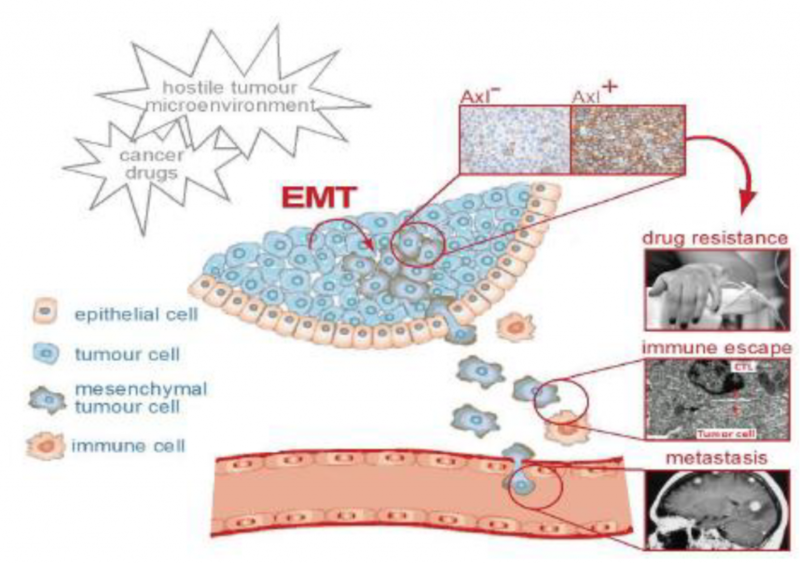 To enable tumour cells to escape immuno-surveillance, there are three key changes that occur during EMT of tumour cells (Exhibit 4). Firstly, there is reduced expression of MHCI proteins (Major Histocompatibility Class I protein), the proteins that present protein fragments to cytotoxic T-cells. Secondly, EMT cells do not form effective immunological synapses with cytotoxic T-cells, which prevents their destruction. Thirdly, mesenchymal tumour cells promote an immunosuppressive tumour microenvironment. In preclinical studies with radiation sensitive and resistant tumour cell lines, Axl inhibition was shown to increase infiltration by cytotoxic T-cells. On top of this, Axl is an innate immune checkpoint. 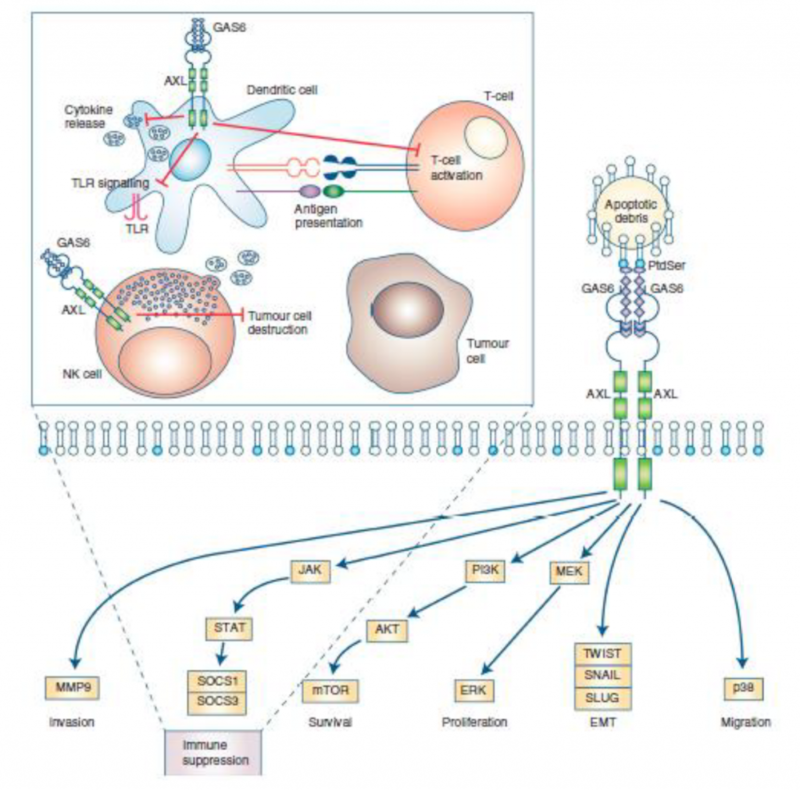 During an immune response, the STAT1 pathway is activated in macrophages and dendritic cells by the cytokine IFN-γ binding to the IFN receptor. This is crucial in stimulating an innate response to an infection, but to prevent an excessive immune response, there is also a ‘safety switch’ triggered by the increased expression of Axl. This results in the activation of SOCS3 genes that down regulate pro-inflammatory cytokines, which are important for the action of cytotoxic T-cells. Consistent with the effects of Axl signalling on tumour cells, high expression of the Axl receptor are associated with aggressive cancers and a poor prognosis for patients (Exhibit 5). The Axl receptor is normally present at very low levels in adult tissues, and it is upregulated in around half of tumours, with some variation according to tumour type. Interestingly, the Axl receptor is rarely mutated, unlike other tumour-associated tyrosine kinase receptors, and BerGenBio has not identified any resistance mutations to bemcentinib. Bemcentinib is under evaluation in a broad Phase II proof-of concept programme, focussed around AML/MDS and NSCLC, and also covering a variety of additional oncology indications and treatment settings in investigator-sponsored trials (Exhibit 6). There have so far being particularly promising signals with bemcentinib monotherapy in AML/MDS and in combination with pembrolizumab in NSCLC. We highlight that across all studies bemcentinib has been extremely well-tolerated. For example, adverse events observed in all three Phase II NSCLC trials are in line with what would be expected during a trial with either pembrolizumab, erlotinib or docetaxel, respectively, as monotherapy. At this stage, it appears that bemcentinib can be used in combination with any other therapy from a tolerability perspective. This is an important aspect of its profile (high selectivity for the Axl receptor), as bemcentinib’s greatest commercial potential is probably from use in combination with various drugs. BerGenBio is currently planning randomised Phase II studies, which will probably have the potential to become pivotal studies, to assess bemcentinib’s activity more rigorously. No details have been disclosed yet, though they should start in 2019. In conjunction with the clinical trials, BerGenBio also has a companion diagnostic programme for bemcentinib; understandably, this is centred on Axl related biomarker assays. It is primarily focused on an immunohistochemistry (IHC) assay to identify accurately the expression of Axl in solid tumours, and a blood test that detects soluble Axl (sAxl) in AML/MDS. The Axl IHC test has initially been used to investigate the activity of bemcentinib in patients with tumour cells expressing different levels of the Axl receptor. Reassuringly, better responses have been seen in those patients with Axl+ tumours (discussed below) in the current clinical trials. BerGenBio is also analysing the correlation between patient response and the expression of the Axl receptor in immune cells located within tumours (such as NK cells and macrophages). No data on the latter has been published to date, but the outcome of this analysis will determine whether BerGenBio stratifies patients with solid tumours according to Axl expression by tumour cells solely, or expression by both tumour and immune cells. With the sAxl blood test, low levels of sAxl appeared indicative of AML/MDS patients with a superior response to bemcentinib treatment, compared to those with high sAxl levels. It has already been shown in other settings that there is an inverse relationship between levels of the activated Axl receptor and sAxl in the blood (Exhibit 7). sAxl, the extracellular domain of the Axl receptor, is shed following receptor cleavage; the shedding process is a known mechanism for the downregulation of membrane receptors. Under normal physiological conditions, or with tumours in which Axl signalling pathway is inactive, there is a relatively high-level receptor shedding. Conversely, when the Axl receptor is bound by the ligand GAS6, as in a tumour with active Axl signalling, the receptor is stabilised and is less likely to be cleaved. In patients treated with bemcentinib, an increase in sAxl levels has been observed in AML/MDS, NSCLC (combination trials with erlotinib and pembrolizumab) and melanoma clinical studies. This is consistent with bemcentinib on target activity inhibiting the activity of the Axl receptor and increasing tumour Axl shedding. The potential biomarkers identified to date need to be validated in subsequent clinical trials; however, they could be used in companion diagnostic tests to identify those patients likely to benefit from treatment with bemcentinib and those that are responding to therapy. This could increase the likelihood of bemcentinib reaching the market and enhance the drug’s commercial prospects, including providing a competitive edge. Source: BerGenBio Note: (1) Garon et al. Pembrolizumab for the Treatment of NSCLC. NEJM 2015: 372:2018-2028, (2) Adams et al. Phase II study of pembrolizumab monotherapy for previously treated mTNBC: KEYNOTE-086 cohort A. J Clin Oncol 35, 2017. Results to date from company-run Phase II studies are summarised in Exhibit 8, with investigator-sponsored trials shown in Exhibit 9. Data have been particularly promising in two indications: we review the indicative efficacy data in NSCLC and AML in more detail below. These findings underpin BerGenBio’s decision to focus further development of bemcentinib in lung cancer and AML. Source: BerGenBio Note: (1) Garon et al. 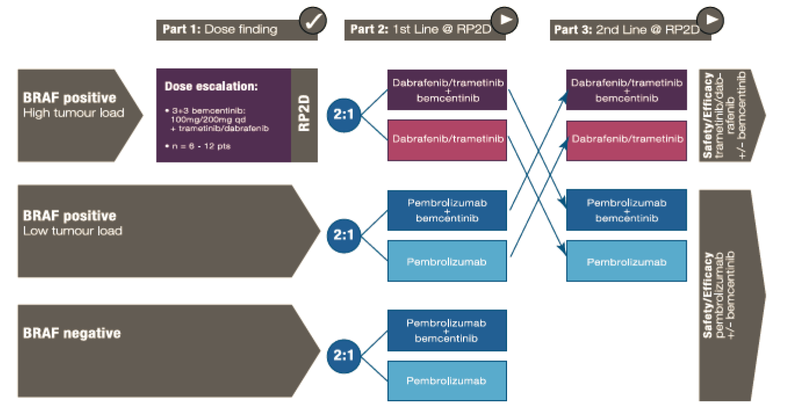 Ramicirumab plus docetxel vs placebo plus docetaxel for 2L treatment of stage IV NSCLC after disease progression on platinum-based therapy (REVEL): a multicentre, double-blind, randomised phase 3 trial. Lancet 384: 665-75, 2014. Increasingly mature data from the Phase II study of bemcentinib in combination with pembrolizumab for previously treated lung adenocarcinoma (NCT03184571), who are immunotherapy naïve, presented at WCLC 2018 in September and SITC 2018 in November reinforce earlier findings from initial results presented during ASCO 2018 (see Update note, 27 June 2018). The results show that bemcentinib can enhance pembrolizumab activity in patients with Axl-expressing tumours, particularly in PD-L1-negative tumours that would not normally respond to pembrolizumab monotherapy. The most recent results are shown in Exhibits 10, 11 and 12. KEYNOTE 010, a Phase III study in NSCLC comparing pembrolizumab monotherapy versus docetaxel in PD-L1-positive patients only. Source: BerGenBio Note: ORR – overall response rate; DCR – disease control rate; PD-L1<1% – PD-L1 negative tumours; PD-L1≥1% – PD-L1 positive tumours; AXL<1% – Axl negative tumours; AXL ≥ 1% – Axl positive tumours. In the KEYNOTE 001 Phase I study in the 495 NSCLC patients, the ORR in PD-L1-negative patients was only 8.1%. This compares to an ORR of 27% in the bemcentinib trial so far. Similarly, median PFS in patients with PD-L1-negative, weak and high PD-L1 expression tumours (<1%, 1-49% and ≥50%, respectively) were 2.1, 2.3 and 6.1 months respectively, which compares to 5.9 months in patients with Axl+ tumours (including both PD-L1-negative and positive tumours) in the bemcentinib trial. However, it should be noted that 66% of the NSCLC patients in KEYNOTE 001 had already received at least two lines of systemic treatment (≥4 lines in 21% of patients), whereas all the patients in the current trial are in the second-line setting. 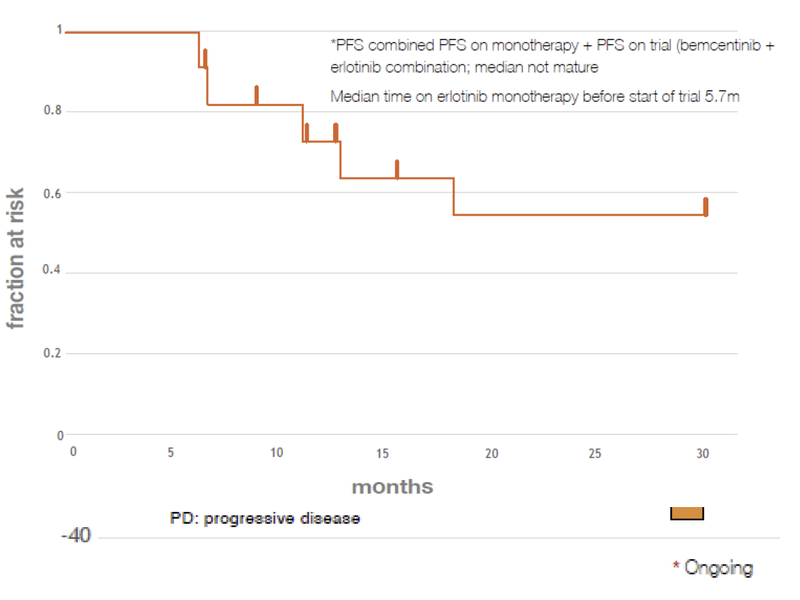 Also, the ORR in the KEYNOTE 010 Phase III trial, which was in a similar setting, was 18% with PD-L1-positive tumours. The ORR of 21% in the current study in the intention-to-treat population containing 24 patients is numerically comparable. However, it should be noted that KEYNOTE-010 was stratified to contain only PD-L1 positive tumours with approximately an equal number of patients with weak and high PD-L1 expression (1-49% and ≥50%, respectively). 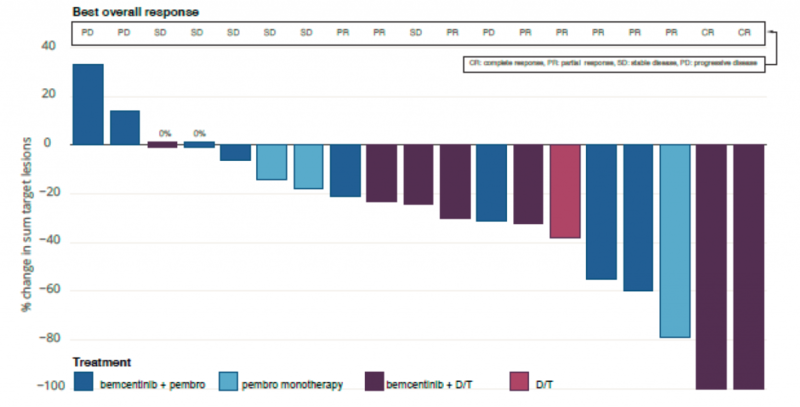 Consistently, high PD-L1 patients have shown best outcomes, with the highest response rates and survival benefits with pembrolizumab monotherapy. By comparison, this trial was heavily slanted towards PD-L1 negative (11 patients, 46%) and weak PD-L1 (7 patients, 29%) patients, and contained only 2 PD-L1 high patients (8%; 4 patients were unclassified). 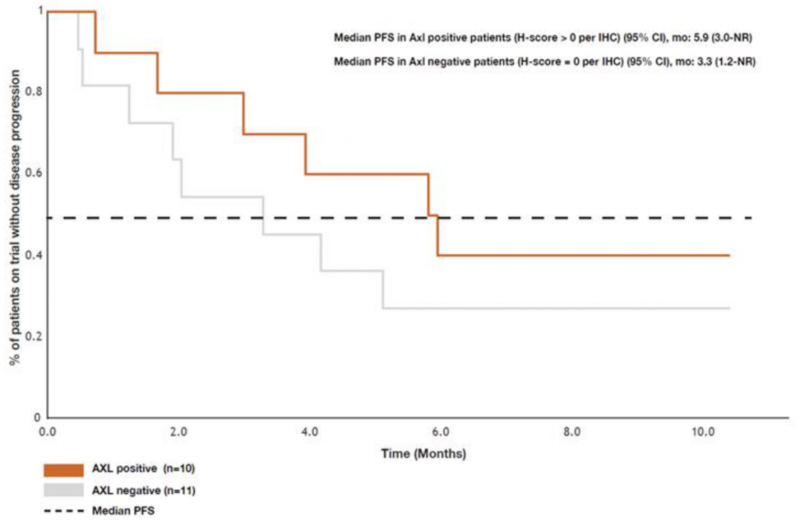 The median PFS in the seven patients with Axl expressing tumours in the bemcentinib trial also compares favourably to that of 4.0 months in the KEYNOTE 010 study, it had not been reached after 7.9 months in the current trial. The response rate in the 10 patients with Axl-positive tumours was notable. The ORR was 40% and these patients included four with PD-L1 negative tumours. It indicates that Axl expression in tumours could act as a valuable biomarker for identifying those patients most likely to benefit from bemcentinib treatment. This trial is still ongoing. The pre-specified efficacy endpoint for the first stage of the Phase II trial– at least four clinical responses from the first 22 treated patients – has been met, so the trial has advanced into the second stage, with an additional 24 patients being recruited under the same clinical trial design. OS data from the first stage of the trial is expected in Q219, and initial ORR data from the second stage of the trial is due to be reported at a similar time. This current trial in second-line, immunotherapy naïve patients is in a population that is gradually shrinking. The standard of care in non-squamous NSCLC is rapidly evolving, so that all patients receive a PD-1 or PD-L1 inhibitor in the first-line setting. PD‑1 or PD-L1 inhibitor monotherapy is used in patients with tumours that express high levels of PD-L1, and PD‑1 or PD-L1 inhibitor in combination with chemotherapy are increasing being used for all other patients. This could lead to BerGenBio expanding the current trial to assess the activity of bemcentinib in combination with pembrolizumab in patients that are immunotherapy refractory/non-responders. The Phase II study in combination with erlotinib (NCT02424617) was designed to assess the potential of bemcentinib in EGFR mutation-driven (mEGFR) NSCLC, both in relation to its potential to reverse tumour resistance to erlotinib, or to prevent resistance developing initially. Source: BerGenBio Note: T790M is a specific mutation in the EGFR protein at amino acid 790. It had been previously reported that some patients responded to bemcentinib in combination with erlotinib in the second-line setting. A poster presented at WCLC 2018 confirmed this (Exhibit 13), supporting the hypothesis that bemcentinib can re-sensitise tumours that develop resistance to erlotinib, via an Axl-driven bypass mechanism rather than the T790M resistance mutation. From a clinical perspective these patients (c50% of patients progressing on first-generation EGFR targeted therapy), have the greatest clinical need, as patients with the T790M EGFR mutation are well-treated by AstraZeneca’s osimertinib (Tagrisso). Therefore, bemcentinib has most commercial potential in mEGFR NSCLC patients without this specific mutation or similar resistance. In the resistance-prevention first-line setting arm of the study, enrolment criteria meant patients had to have received erlotinib monotherapy for at least 12 weeks without disease progression. These patients then received bemcentinib in addition to the erlotinib they were already taking. Thus, any tumour shrinkage observed is on top of any benefit seen while a patient was on erlotinib monotherapy, prior to entry into the trial. The response data is still immature, and so far, one of the 12 patients in this trial arm has achieved a partial response. Of greater interest is the initial PFS data, which appears to confirm bemcentinib can at least delay development of resistance to erlotinib (Exhibit 14). Median PFS in the pivotal Phase III study with erlotinib in first-line mEGFR NSCLC was 10.4 months. The median PFS data in the current trial has not matured and is already greater than 10.4 months (including the time that the patients received erlotinib as monotherapy, median time 5.7 months). It is always sensible to be cautious in comparing data from two different trials, especially in this instance, as the trial designs for the resistance-prevention arm of the current study and the pivotal study with erlotinib are quite different. However, the data from this trial is promising, and in our opinion, would justify advancing the development of bemcentinib in this setting (with erlotinib or another EGFR inhibitor) into a larger Phase II study to improve understanding of its ability to delay/prevent development of resistance to an EGFR inhibitor. Source: BerGenBio Note: The chart includes the period of time the patients were treated with erlotinib monotherapy before they received bemcentinib and erlotinib in combination. Latest data, including PFS data, from the Phase II combination trial of bemcentinib + docetaxel in adenocarcinoma NSCLC (NCT02922777) suggests more clearly that the two compounds work synergistically (as demonstrated in preclinical studies), with bemcentinib delaying development of docetaxel resistance. The ORR in this study to date is 18%, with two partial responses in the 11 patients treated so far (trial is ongoing). This compares to a c5% ORR normally seen with docetaxel monotherapy (Exhibit 15). Also, median PFS is c 8.5 months in this study, vs 5.5 months with docetaxel monotherapy in historic trials (Exhibit 16). Latest data published at ASH 2018 from the Phase II study (NCT02488408) in relapsed and refractory acute myeloid leukaemia (AML) and myelodysplastic syndrome (MDS) continues to demonstrate promising levels of efficacy with bemcentinib monotherapy (Exhibit 17 & 18). An interesting aspect of data concerns the strong correlation between low levels of the soluble Axl (sAxl, inversely related to levels of Axl signalling) biomarker and the high activity of bemcentinib. Six of the 27 AML/MDS patients achieved a clinical response with bemcentinib monotherapy, and all of those patients were classed as having low sAxl in their blood. 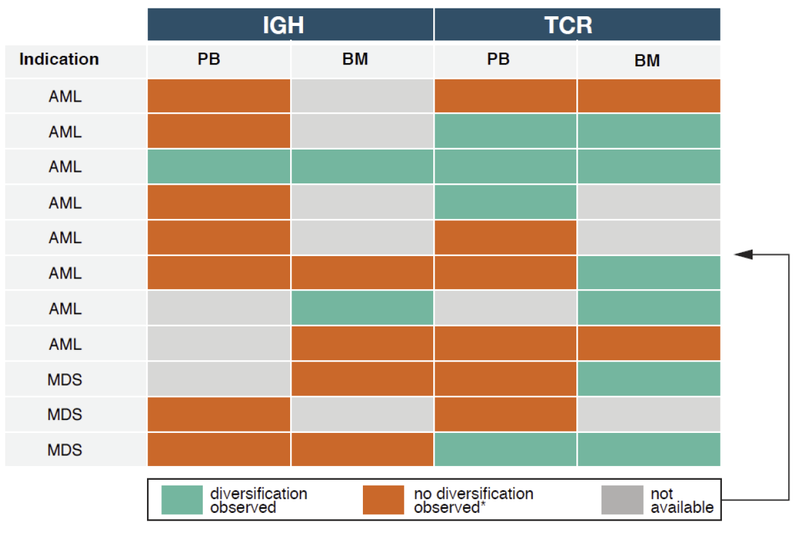 Also of note was the immunological data, which indicated that there had been a diversification of the T-cell repertoire in seven of the eleven patients assessed following bemcentinib monotherapy, and that there had also been a similar diversification of the B-cell repertoire in two of those patients (Exhibit 19). These data suggest that some of the benefit observed in this and other bemcentinib studies could be due to better anti-tumour immune surveillance. It also lends supports for combining bemcentinib treatment with a checkpoint inhibitor, such as pembrolizumab. The clinical trial is ongoing, and patients are now receiving bemcentinib in combination with chemotherapy (low dose cytarabine or decitabine) in the first line setting. 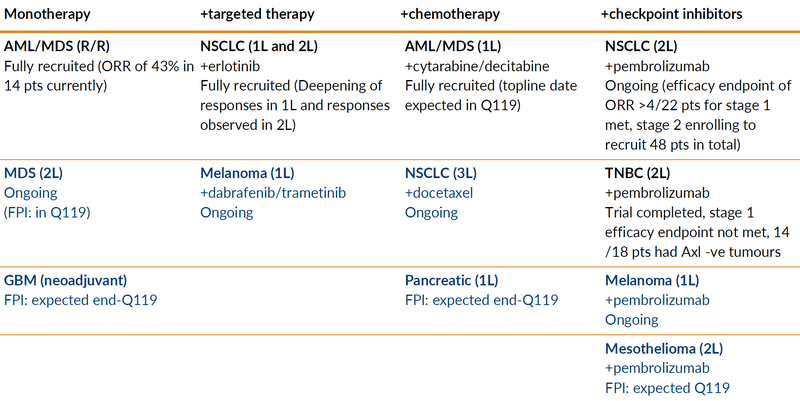 The decitabine combination arm of the trial is fully-recruited and the results are expected in Q119. The potential of bemcentinib monotherapy in high-risk MDS is being assessed as well in the investigator-led Phase II BERGAMO study, which was recently initiated. Updated data from the Phase II trial in metastatic melanoma (NCT02872259) was presented in a poster at ASCO 2018. The trial has a cross-over design with bemcentinib used in combination with either pembrolizumab or dabrafenib (Novartis’ Tafinlar) plus trametinib (Novartis’ Mekinist) in up to 92 newly-diagnosed metastatic patients (Exhibit 20 & 21). So far data from 19 patients has been published (Exhibit 21). Seventeen patients have achieved disease control, with two complete responses, although it is too soon to draw any meaningful conclusions about the efficacy of the various drug combinations from the data. Having said that, it is very reassuring that all drug combinations have been well tolerated so far. It is often not possible to use two drugs in combination because of adverse events, but the specificity of bemcentinib means that this has not been a problem with all drug combinations with bemcentinib that have been tested to date. The Phase II BERGAMO study in 43 patients with high-risk MDS (and AML) with bemcentinib monotherapy, led by Prof Uwe Platzbecker at University of Leipzig, Germany, started at the beginning of January 2018. The trial will assess the value of potential predictive and pharmacodynamic biomarkers for MDS and those associated with patient benefit from bemcentinib. The Phase II MiST study in malignant mesothelioma is being run by Prof Dean Fennell, at the University of Leicester, UK to evaluate bemcentinib in combination with pembrolizumab (and three other treatment regimens); the first patient is due to enrolled in Q119. A Phase Ib/II study in pancreatic cancer to assess the potential of combining bemcentinib with chemotherapy is expected to start in Q119 for which the Principal Investigator is Muhammad Beg MD, at the University of Texas Southwestern Medical Center, US. The trial is supported by Stand Up To Cancer. A Phase II study in glioblastoma with bemcentinib used in the adjuvant setting following tumour resection, the trial is being led by Dr Burt Nabors, University of Alabama, US and should start at the end of Q119. BerGenBio initiated clinical development in January 2019 of BGB149, a monoclonal antibody that inhibits the Axl receptor (Exhibit 22). The Phase I study is in healthy volunteers, and the company expects to start a Phase I/II study in patients in H219. The company is yet to disclose any further details about its development plans, such as which indications it plans to target. BerGenBio could develop BGB149 in oncology, targeting different cancer indications to bemcentinib, or it might decide to develop the monoclonal antibody to treat fibrosis as Axl inhibitors have the potential to block the disease process at various stages. Fibrosis occurs when the normal healing process goes awry, with the formation of excessive scarring. It can occur in most tissues, and severely impairs the function of the affected organ. The initial causes of fibrosis are manifold, and while the precise disease process is not fully understood, it typically involves a common series of events, including secretion of cytokines which provoke a pro-fibrotic, chronic inflammatory immune response that leads to production of excessive extracellular matrix (ECM) proteins (e.g. collagen) and the tissue becoming fibrous in nature. Inhibition of the Axl receptor can block the initial stage of the fibrotic process. However, the progression of fibrosis varies between different tissues and so the role of Axl might vary; nevertheless, targeting the Axl receptor could be an effective treatment for fibrosis in many if not all tissues. 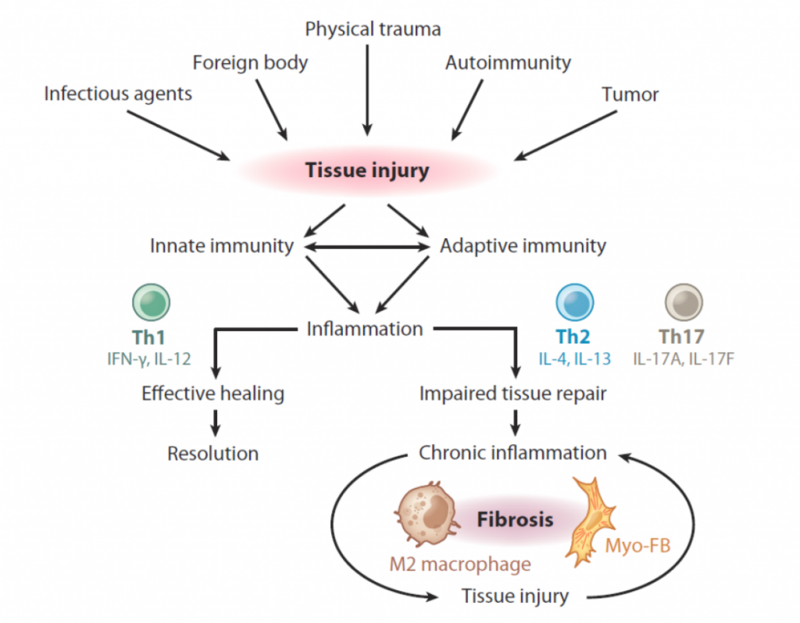 The immune response in both aggressive tumours and fibrotic tissues is similar, with development of Th2-mediated chronic inflammation (Exhibit 23). Conversely, inhibition of Axl signalling results in the triggering of a Th1 response. Axl inhibition also appears to prevent the production of ECM by fibroblasts. Espindola et al (AJRCCM 2018) proved that bemcentinib could inhibit the production of ECM, migration and proliferation of fibroblasts in an IPF model, and importantly, also discovered that high Axl expression was associated with patients with rapidly progressing IPF. BerGerBio could develop either bemcentinib or BGB149 in fibrosis. In one way, BGB149 could be better suited as a chronic fibrosis therapy given that biologics tend to be associated with better medication adherence than oral drugs for chronic indications. Additionally, there could be greater pricing flexibility with BGB149, if it is only developed in fibrosis; but a hybrid strategy is possible. For example, BerGenBio might develop bemcentinib in idiopathic pulmonary fibrosis or IPF (where pricing would be comparable to that in oncology), with BGB149 being developed for more common fibrotic conditions, eg liver and renal fibrosis. BerGenBio is partnered with ADC Therapeutics for its anti-AXL antibody drug conjugate (ADC) programme, ADCT-601 (BGB601). Following a July 2014 deal, in which BerGenBio out-licensed two of its proprietary anti-AXL monoclonal antibodies for the development of ADC(s), ADC Therapeutics took on responsibility for funding and developing this asset. A Phase I trial with ADCT-601 in locally advanced or metastatic solid tumours started in January 2019. ADCT-601 is an ADC composed of a humanised IgG1 antibody against human AXL linked to a cytotoxin (Exhibit 24). The antibody portion binds to cells expressing AXL on their surface, ADCT-601 is then internalised. Intracellular enzymes cleave the linker, releasing the cytotoxic payload, which interferes with cell division, ultimately causing tumour cell death. Source: ADC Therapeutics. Note: ADCT-601 is an ADC composed of a humanised IgG1 antibody against human AXL, site-specifically conjugated using GlycoConnect technology to PL1601, which contains Hydraspace, a valine-alanine cleavable linker and the (pyrrolobenzodiazepine (PBD) dimer cytotoxin SG3199. Favourable therapeutics index with excellent stability in vivo, with a half-life of about 9.5 days at 3 mg/kg and of about 6 days at the maximum tolerated dose of 6 mg/kg (from PK analysis in non-tumour bearing rats). The open label, multicentre, single arm Phase I study of ADCT-601 will enrol c75 patients and has a two-part design. The dose-escalation part will be a standard 3+3 dose escalation design to determine the MTD (maximum tolerated dose) and/or recommended dose for expansion. Part 2, the dose-expansion phase, will consist of three cohorts from one or more selected tumour types, with each cohort enrolling 15 patients. This study will evaluate the safety, tolerability, pharmacokinetics, and anti-tumour activity of ADCT-601 for up to 2 years, and includes a biomarker testing component. Study read-out is anticipated in H121. The 2014 agreement granted ADC Therapeutics an exclusive global license to BerGenBio IPR to develop and commercialise therapeutic Axl ADC products and companion diagnostics, in exchange for milestones and sales royalties. The first milestone from ADC Therapeutics will be triggered by the dosing of the fifth patient in this Phase I study (expected H119). In total, BerGenBio could receive up to £34.25m in milestones per Axl ADC product, split $13.25m on achievement of development and regulatory milestones, and up to $21m in sales-based milestones. The company is also eligible for two-tiered mid-range single digit royalties on global net sales of Axl ADC products and related companion diagnostics, payable for a minimum of 10 years from first sales in each country. Additionally, should worldwide net sales exceed $1bn in aggregate for the first time in a given calendar year ADC Therapeutics is required to pay a one-time low eight-figure $ sales milestone. The approach of targeting Axl expressing cells with an ADC has received clinical validation from Genmab’s progress with Humax-AXL-ADC.. The dose-escalation part of Phase I/II GCT1029-01 study in seven different solid tumours was completed and the Phase IIa expansion cohorts were initiated in June 2018. Further detail on trial design was presented at the most recent Capital Markets Day (September 2018), and while no clinical data has been released to date, a promising case report from a stage 4 NSCLC (unmutated) patient was verbally discussed. Genmab has guided to data from the expansion cohorts during 2019. We estimate that the first clinical trial data from the Phase I study with ADCT‑601 will be published in H120. This will provide an indication of the potential of the ADC, and importantly how it compares to Genmab’s Humax-AXL-ADC. Unsurprisingly, BerGenBio is facing growing competition in developing therapies against the Axl receptor (Exhibit 25 & 26), as the potential of target in oncology and beyond becomes better appreciated. Fortunately, it still has the most advanced selective small-molecule Axl inhibitor in clinical development thanks to the astute decision to in-licensing of bemcentinib (formerly known as R428) from the San Francisco-based biotech, Rigel Pharmaceuticals (discussed below). 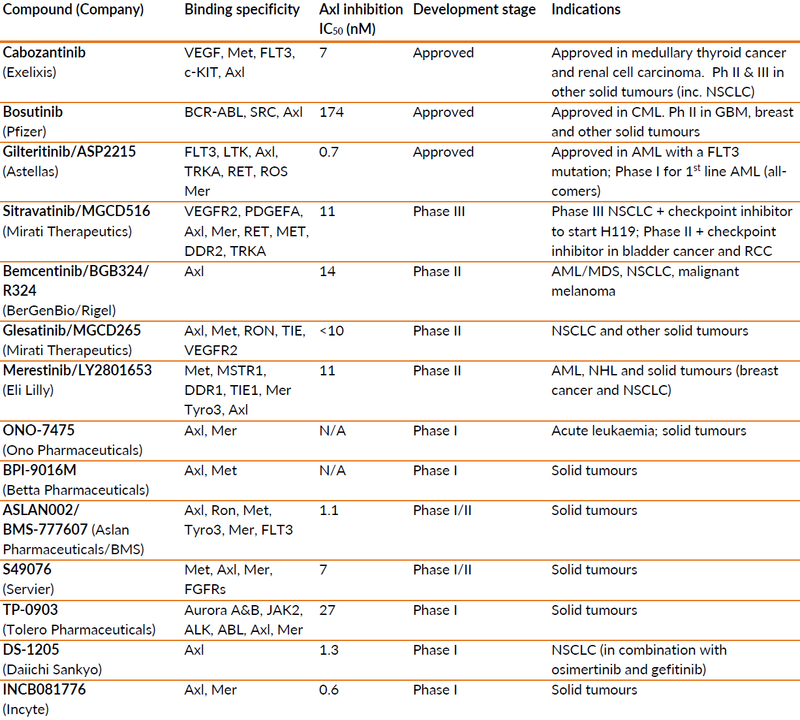 BGB149 will also be the first monoclonal antibody against Axl to enter clinical development, though we estimate ADCT-601 is about two years behind Genmab’s Humax-AXL-ADC in development. On top of BerGenBio having three advanced programmes targeting Axl, it is also important to recognise the selectivity of all of the therapies. This could be particularly important for bemcentinib, and confer a significant competitive advantage. It appears that Axl inhibitors (excluding ADCs) have greatest commercial potential when used in combination with other agents. The data on bemcentinib so far indicates that it can be safely combined with erlotinib, pembrolizumab and docetaxel, without any dosage reduction. In contrast, a trial combining Astellas’s gilteritinib with erlotinib in NSCLC had to be terminated after the treatment of only 10 patients due to adverse events, although we note Mirati’s sitravatinib is well tolerated in combination with nivolumab. BerGenBio’s companion diagnostic programme for bemcentinib could also expedite the product’s route to market and provide BerGenBio with a significant competitive advantage. At the moment, it appears that the greatest competition to bemcentinib is likely to come from sitravatinib in solid tumours (Phase III study in 2L NSCLC in immunotherapy-experienced patients is due to start in H119) and gilteritinib in AML (Phase I ongoing in newly diagnosed AML, regardless of FLT3 status), but neither of these products have Axl-related companion diagnostic programmes. So, assuming all three products eventually compete on the market, oncologists will only be able to identify those patients likely to respond to an Axl inhibitor, if they prescribe bemcentinib. A companion diagnostic could also enable bemcentinib to be reimbursed more favourably. Source: Trinity Delta, company websites. Note: DAR = drug-to-antibody ratio; PBD = pyrrolobenzodiazepine; MMAE = monomethyl auristatin E.
BerGenBio was initially focused on developing a monoclonal antibody against Axl, but on becoming aware of Rigel’s Axl inhibitor assets, it opportunistically in-licensed various selective Axl inhibitors from the company in June 2011 in a back-end weighted deal. Subsequently, BerGenBio has prioritised the development of the small molecule bemcentinib (formerly known as both BGB324 and R324). Under the terms of the Rigel deal, BerGenBio obtained the worldwide exclusive rights to bemcentinib and eight back-up compounds, with the right to sub-license the assets. It exercised its option to in-license nine other Axl inhibitors from Rigel for $2m in June 2016. In exchange, BerGenBio agreed to make various payments to Rigel, and has so far paid: time-based payments of $0.5m in 2011 and 2012, a similar payment of $1.7m in 2016, and $3.3m in February 2017 relating to the first Phase II initiation for the first product. Future payments are dependent on whether the product is developed/commercialised in-house or by a partner. Additionally, Rigel is eligible for tiered royalties of 5%, 7% or 9% of net sales, if sales are under $500m, between $500m and $1bn, or over $1bn. In September 2018, BerGenBio and Rigel entered into arbitration with respect to ‘the interpretation and application of certain provisions’ of the original license agreement, particularly in relation to ‘rights and obligations’ in the event of a sub-licensing or sale of bemcentinib or back-ups. We expect this arbitration to conclude by end-March 2019. BerGenBio is evaluating its partnering options for bemcentinib. While the final decision will depend on the clinical data, we believe that it is most likely that BerGenBio will look to partner bemcentinib with a large player on completion of the current programme of Phase II studies. Assuming data from the trials confirm bemcentinib’s potential to treat a broad range of tumours and in combination with various other regimens (targeted therapy, immuno-oncology, and chemotherapy), considerable resources would be required to conduct a broad Phase III oncology programme that would be necessary to maximise the value of bemcentinib. Both the Phase Ib/II trials in AML and NSCLC + erlotinib are expected to recruit over 60 patients. We therefore believe that BerGenBio will pay 35% of revenue receipts to Rigel should it enter into a sub-licensing agreement. The main risk with BerGenBio currently relates to the outcome of the clinical trials. The initial results are promising, but the true potential of bemcentinib will only become apparent with the complete data from the Phase II studies. The broad programme, combined with the biomarker analysis, partially de-risks the company, but it should be recognised that BerGenBio is developing a first-in-class product, and the biology of Axl is particularly complex and not fully understood. It is also possible that bemcentinib might also have a greater effect on overall survival (OS) than progression free survival (PFS), as has been seen with some immuno-oncology therapies. BerGenBio is yet to decide whether to take bemcentinib to market itself or with a partial/full out-licensing of the product. The novelty of the compound, while making the development process more challenging, means that it is likely to be commercially attractive to prospective partners, especially as it has such broad potential as an oncology therapy (assuming the current trials are successful). Should BerGenBio look to partner bemcentinib, it is important to appreciate that the best deal might not be the one with the greatest bio-dollars, but the one with the most committed partner that will devote sufficient resources to optimise the product’s development. The development of bemcentinib is currently focused on AML/MDS and NSCLC in various settings (monotherapy, with targeted therapies, with chemotherapy, and with the checkpoint inhibitor pembrolizumab), with several investigator-led trials, which could lead to the expansion of the programme. The results of the Phase II programme will determine which indications BerGenBio will target with bemcentinib. This decision will be based on both scientific and commercial considerations. The potential of bemcentinib as an immuno-oncology therapy agent is particularly exciting, however, this field is highly competitive. Although bemcentinib is currently the most advanced selective Axl inhibitor in development, there will probably be others that enter the clinic now that the important role that Axl plays in EMT, chemotherapy resistance, and immuno-oncology is better understood. Clearly, the rate at which BerGenBio can advance bemcentinib will determine the first-mover advantage, should it reach the market. On top of these specific risks, there are also other typical risks associated with drug development, including patent litigation, financing, and regulatory uncertainties. Regarding its patent position, the composition of matter patent (PCT/US07/089177) is due to lapse in 2027 without an extension, and there is a patent pending covering the use of bemcentinib (PCT/GB2014/053548), which should protect the compound from competition through to 2034. There are also various other patents (awarded and pending), which could provide a degree of protection through to 2036. With BerGenBio being a classic drug development company, it is well-suited to valuation using a rNPV methodology. Typically, the rNPV of the individual clinical projects (adjusted for the success probabilities) are summed and netted against the costs of running the operation. In the case of BerGenBio, we value bemcentinib in each indication in which it is currently being developed, with the success probabilities based on standard industry criteria for each stage of the clinical development process but flexed to reflect the data in each indication. Using this approach, we value BerGenBio at NOK3,143m ($370m), equivalent to NOK57.45/share; the details of our valuation are shown in Exhibit 27. This is an increase in NOK177m ($21m) or NOK3.24/share on our previous valuation and is due to the addition of ADCT-601 as it has entered clinical development. Throughout the valuation we continue to use conservative assumptions, and in line with this policy, we have not included BGB149 in our valuation yet as we do not know the company’s development plans for the asset. Being prudent, we have assumed the average cost of treatment per patient across all indications will be $80,000 in the US and two thirds the price in Europe. This compares to an estimated average cost of treating a patient with AstraZeneca’s osimertinib (Tagrisso) of $200,000 and Merck’s pembrolizumab (Keytruda) of $150,000. We believe this is sensible given the limited clinical data. Also, bemcentinib has the potential to be used to treat most solid tumours, either in combination with chemotherapy or immunotherapies, and has very low cost of goods, so a relatively low price might be settled upon to ensure that reimbursement issues do not hinder its adoption. 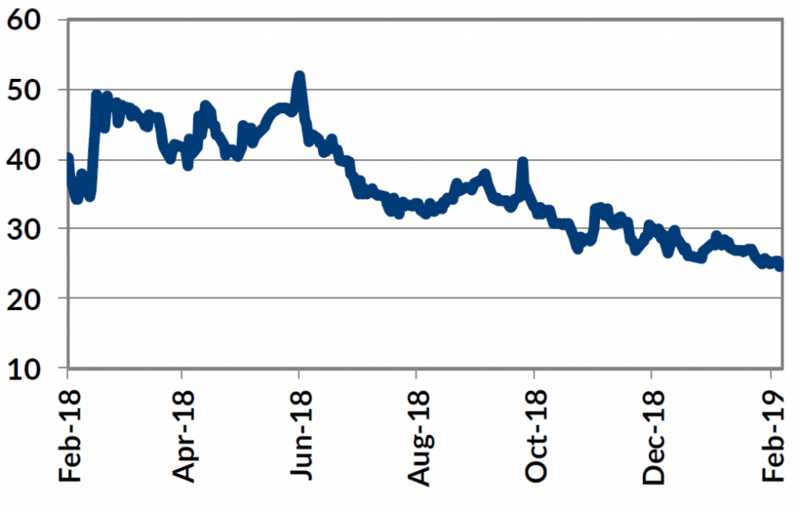 The shares are currently trading at 57% below our valuation of BerGenBio, we expect this difference to be reduced over the coming year as clinical data is reported (Exhibit 28). Over the next six months, we expect results to be presented at ASCO on 31 May to 4 June, and possibly other conferences as well. The new data could act as share price catalysts. The most eagerly awaited results will be the overall survival data from the first stage of the Phase II study in NSCLC with pembrolizumab and the results from the trial’s second stage, which will hopefully confirm the findings from the first stage. These data should be reported in Q219. Source: Trinity Delta. Note: Valuation assumes BGB324 is out-licensed in 2019 and loses patent protection in 2034. The value of each indication includes the current R&D expenses associated with the current clinical trials. HNSCC: Head & neck squamous cell carcinoma; cHL: classical Hodgkin lymphoma; MSI-H: microsatellite instability-high cancers (primarily colorectal cancer). BerGenBio is gradually increasing its investment in R&D, as would be expected for a company in its situation with a broad Phase II programme for its lead compound bemcentinib and a second asset about to enter clinical development. This has resulted in the company’s operating costs increasing from NOK132m in FY16 to NOK184m in FY17 and to NOK195m, we forecast that this trend will continue with estimated operating expenses of NOK240m in FY19 and NOK251m in FY20. At this stage, we do not know BerGenBio’s plans for the randomized Phase II studies with bemcentinib due to start in mid-2019 or the development programme for BGB149. Once these have been disclosed, we will revise our estimates appropriately. It is also likely that BerGenBio will receive a milestone payment from ADC Therapeutics, triggered by the dosing of the fifth patient in the Phase I study; we estimate that this will be worth c NOK10m, but to be conservative we have not included it in our forecasts. BerGenBio has a strong balance sheet with had a cash position of NOK360m (c $42m) in cash and no debt at FY18. The company raised NOK176.8m net (NOK187.5m gross) in a private placement from issuing 16m shares at NOK40.50 per share in April 2018. It is also making use of non-dilutive sources of funding where possible, for example it is currently negotiating with the Research Council of Norway for a grant of up to NOK12m over three years to fund research into Axl’s role in fibrotic diseases. We estimate that the company currently has sufficient cash to operate to mid-2020, though this would be considerably extended should BerGenBio partner bemcentinib. No significant changes have been made to our estimates, following the FY18 results. No Axl antibodies currently appear to be in clinical development, however Aravive is developing a Fc-fusion protein, AVB-S6-500, to sequester GAS6 and thereby prevent Axl signalling. AVB-S6-500 is in a Phase I/II in ovarian cancer. Stein Holst Annexstad Non-Executive Chairman Joined in February 2016 He has senior industry experience, both at executive and Board levels. He is former executive of Dyno Industrier AS (fine chemicals), and became CEO of pharmaceutical firm Nycomed AS (subsequently merged with Amersham Plc and thereafter merged with GE). He was head of AS Isco Group, an Executive Search and Corporate Advisory Group. He co-founded in 1996 NorgesInvestor AS, an Oslo-based Private Equity firm, and was in 2008 the first Chairman of Investinor AS (the VC of the Norwegian State). He was Chairman of Algeta ASA, the pharmaceutical start-up that developed Xofigo and was acquired by Bayer in 2014. Other previous Chairman positions comprise commercial banking, business school, public R&D and various industrial enterprises. Rune Skeie CFO Joined in 2018 as CFO. He has over 20 years of financial management, corporate development, corporate governance and advisory experience with public and private companies across multiple sectors. Prior roles include CFO of REMA Franchise Norge, and various roles of increasingly responsibility at EY, most recently as Executive Director, he is a Registered Accountant and a State Authorised Public Accountant. Dr Anthony Brown CSO Joined in October 2015 as Research Director and promoted to CSO in 2018. He has over 25 years of drug discovery experience of both small molecules and biological therapeutics. He has managed strategic alliances with Pharma and Biotech and lead several novel programmes in oncology, from early research through to clinical studies. Prior roles include senior management and director level positions at British Biotech, OSI Pharmaceuticals, Piramed Pharma, Cancer Research Technology and CellCentric. He holds a doctorate (University of Oxford) and MBA (Oxford Brookes University). Prof James Lorens Senior Scientific Advisor Co-founder, CSO (until 2018), and a Professor at the Department of Biomedicine at the University of Bergen. He leads a large internationally active academic research laboratory comprising 22 researchers, that is focused on cancer research. Prof. Lorens is an author of more than 85 peer-reviewed articles and numerous patents. He worked at Rigel after completing his postdoctoral studies at Stanford University and has managed many large collaborations with major pharmaceutical and biotechnology companies.